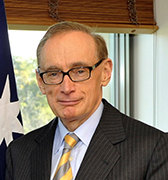 Our Patron, Professor the Hon Bob Carr, is the longest continuously serving Premier in the history of New South Wales. Bob entered the Senate in 2012 and served as Australia’s Foreign Minister for 18 months. Since leaving politics Bob has led a distinguished career as a defacto diplomat, author and academic. Bob received the Fulbright Distinguished Fellow Award Scholarship. He has served as Honorary Scholar of the Australian American Leadership Dialogue. He is the author of: My Reading Life (2008), Thoughtlines (2002) and Diary of a Foreign Minister (2014). He is the Director of the Australia-China Relations Institute at UTS.